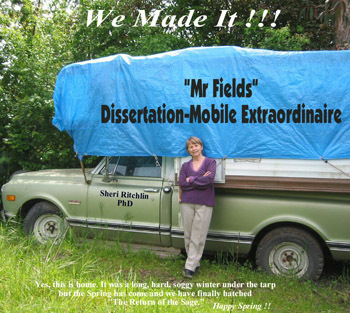 Sheri Ritchlin is a writer, lecturer, and dream worker who does much of her writing and dreaming in her camper, Mr. Fields, currently perched in Sonoma County, California. She came to the Bay Area from Del Mar, California, to enter the California Institute of Integral Studies, where she completed her dissertation—The Return of the Sage: A New Cosmology Meets the Way of Heaven and Earth in the I Ching—under the guidance of Yi Wu, Richard Tarnas, and Brian Swimme. She is the author of One-ing and Dream to Waken, as well as articles published in Parabola, Noetic Sciences Review, A Tribute to Thomas Berry, and The Evolutionary Epic: Science’s Story and Humanity’s Response. She is currently at work on Fields of Light: 2012 and the Venus Transit of the Sun.